I hesitated before answering, thinking, Ummm… marshmallows. And I didn’t mean that she had eaten a handful of marshmallows for a snack. Like, straight up, I had placed an enormous pile of marshmallows in front of her as her meal. Her entire meal. Directly on the table without a plate. Now, I’d like to give you a little bit of insight on my twelve-year-old daughter. She has special needs. Not only does she have Down syndrome, she also had a severe seizure disorder as a baby called West syndrome. These two diagnoses are paired with both autism and a severe cognitive impairment. To say that our lives are interesting would be an understatement. Don’t get me wrong. I’m actually a decently healthy person on the whole. I keep our kitchen stocked with things like fresh fruits, veggies, yogurt, and nuts on a regular basis. Things such as fast food and candy are kept to a minimum. Children with Down syndrome tend to gain weight very easily for a variety of reasons—some as simple as their generally short stature, and others such as hypothyroidism and a decreased metabolic rate. These are generalities, to be sure. Every child with Down syndrome is different. Severe food allergies, as well as celiac disease, can be a common affliction for individuals with Down syndrome. Thankfully our daughter is one of the lucky ones and has very few of these manifestations. When you add up all of these potential concerns, however, it heeds parents to be mindful of their child’s diet. I am mindful, within reason. My daughter never eats sugary cereals. Juice is almost always a no-no. Water bottles and carrot sticks are on hand pretty much 24/7. Apple slices almost always replace French fries when we do indulge in fast food (Cuz, we do. We’re human and we’re American). You know, all of the basic choices that we “good” moms can brag about over coffee with our friends. I’m not the mean mom who denies her child sweets while the rest of the kids her age are eating cupcakes and ice cream. The silver lining of having a child with a severe cognitive impairment is that she honestly just doesn’t care about the junk food she’s missing out on. She will happily munch away on her green pepper slices without feeling as if I’m withholding something from her. Trust me, if she was aware that cupcakes were an option I’d be giving in constantly. I’m a big softie and a terrible mother that way. Why let your kid be healthy when they can like you, right? OK, not really. I wouldn’t be that bad. I’d still make her eat her veggies. I can guarantee though that sugar and saturated fats would be involved in her diet a lot more often if she was aware that they were an option. Life with a child who has such severe special needs is unbelievably challenging. There is so little that you can control. In our particular situation, her diet and physical health— to a small degree—is something that I can control. So I do. That is, until the days when I’m zonked beyond belief, and the thought of hand feeding my twelve-year-old daughter yet another meal just makes me want to cry. Think about it, moms of the world: 12 straight years of having a baby/toddler, with no end in sight. I love my precious little bundle of sunshine more than life itself, and I would do anything for her. I’m gonna be honest though. Sometimes I’m plain worn out. Sometimes I just don’t have it in me to make an egg white omelet with freshly sliced organic fruit and then hand feed her every single bite. Sometimes I want to give her an enormous pile of marshmallows that she can feed herself while making a limited mess. I’m a firm believer in the phrase “everything in moderation.” I genuinely feel that this particular expression applies to being that “perfect” mom at meal time as well. This is one of the really sad things about our society today. Making sure that our kids eat nothing but healthy and nutritional meals has basically become a competition. I don’t know about you, but I’ve felt the need to actually lie about our meal choices on occasion. I’ve alluded to the fact that my daughter ate a well-balanced meal the night before, while in reality she had frozen pizza and Doritos. How depressing is that? And who needs that kind of pressure?! Let me tell you, this mama doesn’t. I am so far from being a perfect mom, as I’m sure you can already tell. Here’s the solid truth, though—I love my daughter. I am a good mom. I hug her. I kiss her. I sing to her and read her books. I am there for her. Every single day. There are rare occasions, however, that being there for her means that I give her a pile of marshmallows to eat for breakfast. Sometimes we switch it up to fruit snacks. I will literally open an entire box of fruit snacks and dump them out in front of her, letting her go to town. Of course we want our kids to be healthy. Of course we want their hearts to be in tip-top shape and their blood pressure to be in “non” heart attack range. We want them to live long and prosper…no pun intended. We want them to have the healthy glow and vivacious energy that comes from healthy living. We moms, though? We’re only human. We’re tired some days. Actually… scratch that. We’re freaking exhausted some days. Some days we feed our kids marshmallows because it’s all we have the energy for. It doesn’t matter if you have a child with special needs or a child that is as typical as can be. Being a mom is one of the most physically and mentally draining jobs a girl can ever have. Give yourself permission to, rarely, let your kid eat marshmallows for breakfast. Give yourself permission to confess said sugary meal to your other mom friends. Give yourself permission to be imperfect, and be proud of it. Who knows? Maybe you’ll be just the inspiration your mom friends need to realize that, every great once in a while, it’s OK to let go. Today I’m feeling good. Today my daughter will have fluffy scrambled eggs with a side a fresh raspberries and a glass of milk for breakfast. She may go to the cupboard and pull out the bag of marshmallows, asking for a menu change. 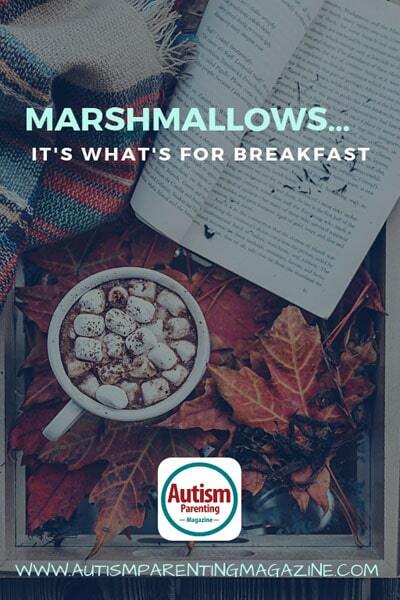 I’ll gently let her know that marshmallows are a “sometimes” food. Today she is going to be well balanced and healthy. Who knows, though? Maybe tomorrow. Emily Davidson lives in Kalamazoo, Michigan with her husband and kids. She's a classically trained pianist, but is currently a stay-at-home mom while teaching private music lessons on the side. Her husband, Adam, is the lead Pastor at Portage Free Methodist Church. She has three children; Alexis, age 11; Malachi, age 9; and Zachary, age 6. Her daughter, Alexis, was born with Down syndrome. When Lexi was three years old Emily discovered that her daughter was also autistic. Lexi is now doing phenomenally in both school and therapy, and loves to share her joy with the world around her through her beautiful smile and amazing hugs.